. : Optics & Photonics Focus :: In Pursuit of Bacteria: A Cat-and-Mouse Game :. Recent results give new life to an old, almost forgotten technique: upconversion imaging could soon make possible the wide use of light technology for infrared detection. Black holes are enigmatic astronomical objects, which remain, as of yet, unobserved. We may, however, be in a position to trace their trail. It is possible that a rotating black hole imparts small twists to photons passing nearby, which we may be able to detect from Earth. Recent experiments lend a brand new twist to the tale unfolding in the field of electron microscopy. Promising electron vortices have made their appearance at the crossroads between nanotechnology and magnetism. Cells in the immune system seem to have a sixth sense for tracking down invasive bacteria. A new technique for manipulating single cells could revolutionize our understanding of their tactics and eventually lead to new strategies for mobilizing our body's defenses against disease. Neutrophil tracks a pseudo-bacterium. A single neutrophil tracks a microbead as it mimics a slow-moving bacterium. The cells in our body do not have ears or eyes to sense their surroundings; instead, they smell and react to complex chemical signals. Cells in our immune system, for example, move in response to external chemical stimuli. Until recently, it was not possible to measure this movement, known as chemotaxis, at the level of single cells. Holger Kress and coworkers at Yale University have proposed a new technique based on holographic optical tweezers that will allow researchers to better understand how our bodies use chemical gradients to direct the movement of important disease-fighting cells. When a bacterial infection occurs in the body, the immune system recruits various specialized cells to migrate to the infection site and repair the damage. Neutrophils are a class of white blood cells that function like the paramedics or the fire brigade; they arrive on the scene within minutes and work quickly to limit the extent of the damage. Thus, neutrophils are in a constant cat-and-mouse game with the harmful organisms that find holes in our body’s defenses. When bacteria try to spread and wreak havoc throughout the body, the neutrophils “track their scent” and pounce on them . However, clever disease-carrying agents continue to find little mouse holes to hide out in. Neutrophil attracted by two microbeads. A neutrophil simultaneously pursues two microbeads by reshaping itself. To aid neutrophils in their fight against bacteria, we need to understand some fundamental, yet still unanswered questions: how does a single human neutrophil respond to the scent, or chemical signature, of a particular bacterium? How do multiple white blood cells coordinate with each other to fight disease? Until now, researchers have stimulated cells with constant stimuli, linear gradients, or micropipettes. These techniques allowed researchers to measure the immune response on a small scale, but they could not reveal the behavior of individual immune cells. Such techniques are analogous to releasing a bunch of cats into a mouse-infested house and observing the resulting chaos. To measure the response of single neutrophils to small chemical stimuli, the new approach proposed by Kress and colleagues uses holographic optical tweezers to strategically position tiny chemical sources near the living cells. It offers more precise control of chemical signals than ever before and more flexibility in designing complex stimuli and determining immune cell response. 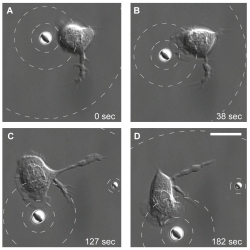 The new approach has the ability to control chemical concentrations down to 1 micrometer-length scales during timescales ranging from less than a second to more than an hour; such a broad time-range permits one to investigate both the period when a single neutrophil is stalking a bacterium and the moment when the neutrophil accelerates in the direction of its prey. Optical tweezers, the key ingredient of Kress’ technique, were developed in the 1980s as a tool for holding a small particle in place by taking advantage of the trapping forces provided by a focused beam of light. "The more recent development of holographic optical tweezers allows the simultaneous trapping and manipulation of large numbers of particles," says Dr. Kress. This key optical technology has allowed Kress and his colleagues to position micron-sized beads in solution, with a level of precision unattainable by previous methods. These microbead sources were designed to release chemoattractant molecules at a known rate and mimic the effect of placing bacteria in the vicinity of a neutrophil. The released chemoattractant molecules are like the trail of cheese crumbs that allows the neutrophil to track its prey. A challenge of this research was to design highly-controllable chemical sources that release chemoattractant molecules at a known rate. "Among other things, these microparticles needed to be the right size (about one micrometer) and they needed to release the right amount of chemicals per time to enable concentration profiles that are suitable for cell stimulation," says Dr. Kress. After fabricating the microbeads, the researchers carefully characterized them and arrived at a bead design that was capable of inducing chemotaxis in nearby cells. Neutrophil repelled by two microbeads. A migrating neutrophil squeezes in between two microbeads loaded with a repulsive chemical. Kress and his team explored various dynamic microbead configurations to measure the responses of neutrophils to various types of stimuli. 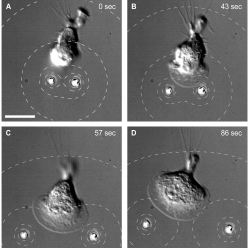 By slowly moving a microbead source in its holographic optical trap, they observed via scanning electron microscopy (SEM) how a nearby neutrophil begins moving and changing its orientation in response to the movement of the source. In this case the neutrophil followed the microbead like a fish follows the bait. 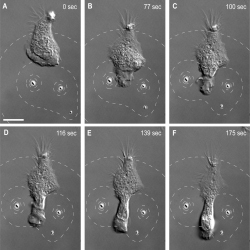 In another experiment, they positioned two beads close to a cell and this formed a lamellipodium (flattened extension shape), which grew as the beads moved apart and the cell attempted to follow. They also tried loading the microbeads with a different chemical that causes deformation of the cell’s cytoskeleton. In this scenario, separating the beads allowed a migrating neutrophil to squeeze through the gap between them. This repulsive effect can be visualized clearly and it can be measured for the first time under SEM. "The scientific community responded very positively to our findings," says Kress. He was invited to present the new technique at this year’s Meeting of the Society for General Microbiology in Edinburgh. According to Robert Insall from CR-UK Beatson Institute for Cancer Research, Glasgow, UK, "This work combines an old technique – the application of force to microscopic beads using a focused laser beam, the so-called ‘laser tweezers’ approach - with an old problem - how do cells respond to complex signals in space?" This optical approach to the chemotaxis problem offers exciting possibilities for research. "This technique allows more interesting things, like conflicting stimuli, to be used, and the sensitivity of different parts of the cell to chemotactic stimuli can be probed," says Insall. This new technique could greatly enhance our understanding of how living cells communicate and how they process signals from their environment. "A better understanding of chemotactic signaling for example can lead to a better understanding of how our immune system works," says Kress. "This knowledge can, in the long run, help find better cures for diseases." According to Dr. Insall, "[The technique] will allow theories of chemotaxis - how cells move towards attractive molecules - to be tested in far greater detail than before." Crawling Neutrophil Chasing a Bacterium, http://www.biochemweb.org/neutrophil.shtml (retrieved June 16, 2010). SY is currently a graduate student at the University of Arizona’s College of Optical Sciences. Holger Kress, Jin-Gyu Park, Cecile O. Mejean, Jason D. Forster, Jason Park, Spencer S. Walse, Yong Zhang, Dianqing Wu, Orion D. Weiner, Tarek M. Fahmy & Eric R. Dufresne, Cell stimulation with optically manipulated microsources, Nature Methods (2009) 6, 905 - 909 (link).